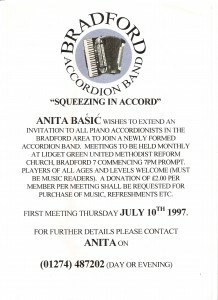 Bradford Accordion Band (affectionately known as BAB) was founded in 1997. Prior to the formation of the band, a small group of local accordionists had been ‘getting together’ to play a variety of music for pleasure. 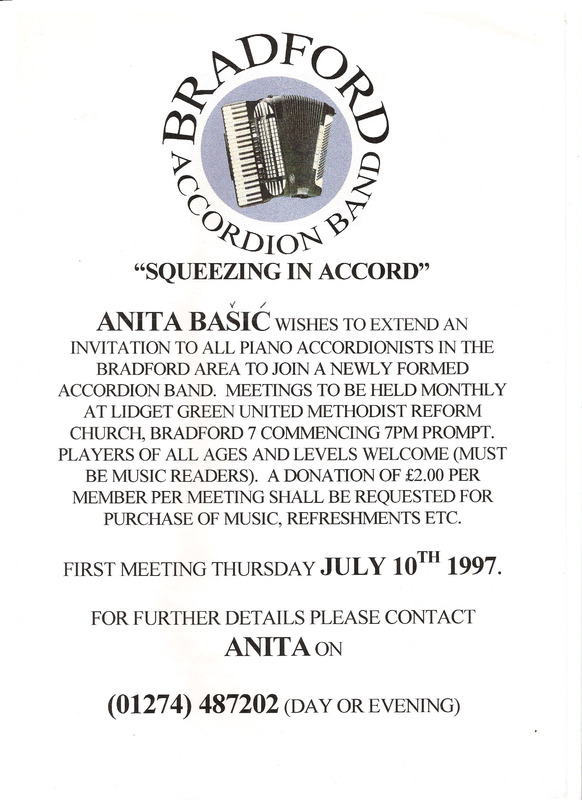 Following a number of requests, Anita Bašić, a Bradford – based accordion teacher, decided to extend an open offer to the group’s membership and the first meeting of BAB was held at Lidget Green United Methodist Reformed Church on July 10th attracting 15 players. Shortly afterwards, the band was joined by renowned local accordion teacher and performer, Raymond Jones and membership numbers went from strength to strength. Members hail from all over Yorkshire including : Huddersfield, Halifax, Wakefield, Leeds, Bradford, Glusburn and even Bolton Percy! Today BAB rehearses weekly at Northowram Community Centre. Musical Director Anita Bašić leads 23 accordionists plus a drummer and keyboard player in performing a wide- ranging repertoire that includes classical, pop, folk, continental and show music.